This blog provides information and answers questions related to psychotherapy and mental health. Topics include finding the right therapist, education about types of therapy, what to expect, and finding low fee psychotherapy. Relevant recent research is discussed. Suggestions are given related to life problems such as family holiday visits. All appropriate comments and inquiries will be responded to, whether or not the questioner is in the New York City area (where I am located). 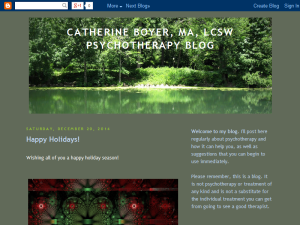 This what your Catherine Boyer MA LCSW Psychotherapy Blog Blog Ad will look like to visitors! Of course you will want to use keywords and ad targeting to get the most out of your ad campaign! So purchase an ad space today before there all gone! If you are the owner of Catherine Boyer MA LCSW Psychotherapy Blog, or someone who enjoys this blog why not upgrade it to a Featured Listing or Permanent Listing?